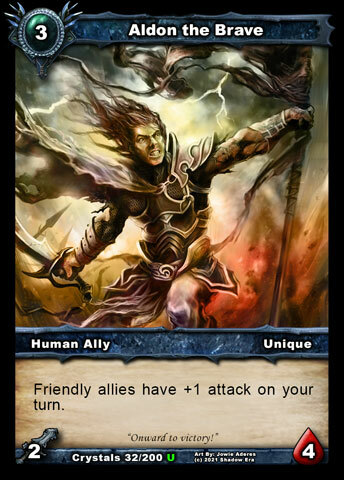 Two allies for the cost of one? Mini built-in Aldon ? Solid presence to boot? Sign me up! Howlfang is a great ally, with a possibly greater back story! 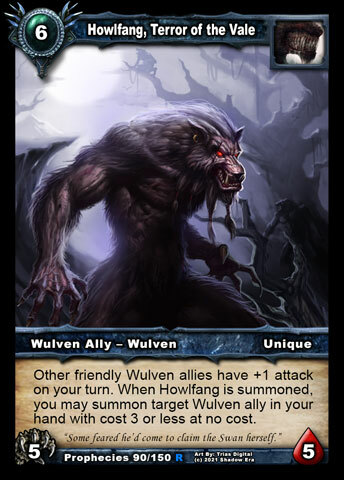 Ability: Other friendly Wulven allies have +1 attack on your turn. 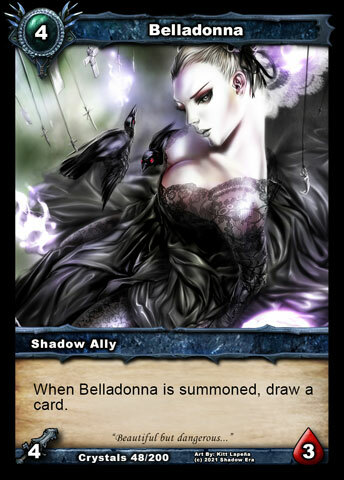 When Howlfang is summoned, you may summon a Wulven ally of 3 cost or lower for free. Flavor: "Some feared he'd come to claim the Swan herself." When the Shadow Gates began appearing around Layar, Tinnal was among the first worlds they connected to. Although Howlfang was not among the first Wulven to pass through this Gate, in fact he only did so while chasing a pack of Minotaur slaves as they tried to escape, his ferocity and leadership quickly placed him high among the Man of Shadow's favored lieutenants. Had he been able to harness the powers of a Shadow Crystal few doubt Howlfang would have been able to vie for leadership of the Wulven packs. If this fact had ever bothered him, though, the Wulven warrior hid it well. As a trusted leader, Howlfang was the obvious choice to send as a diplomat to try swaying the minds of the leadership in Irum and he volunteered to do it the moment the idea was brought forward. Sharing Layar's most western border, Irum was a wasteland of stone. As such the people became her only export, trained bands of mercenaries always willing to go the highest bidder. A thousand years of peace had badly damaged the economic stability of the nation, and the fact a member of royal blood had already joined the Shadows led some of the leaders to consider the possibility of joining the invaders from a dozen other worlds. When Howlfang demanded the respect of their talks being performed in the Vale, capital of Irum, his terms were agreed upon quickly. The clever creature, however, had a different idea. Rather than negotiate with the Irumians he planned their complete destruction to serve as a warning to the other human forces. Under the cover of night, and aided by the sell-sword nature of many of the mercenary bands still loyal to Belladonna , Howlfang launched an unprecedented attack against the Swan and her city. Valiant as they might have been, the city's defenders were not prepared for such an assault. The Swan's advisers demanded she abandon the city, but the young ruler held strong, still believing they had a chance. 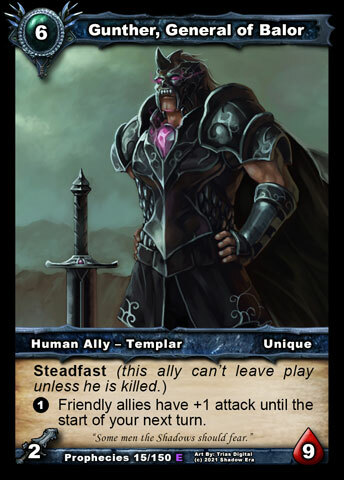 Gunther had also been in the Vale, attempting to bring Irum into the forces of the human armies. When the General had heard that a Wulven would also be present, he'd ordered every able-bodied soldier that could fit onto the 'supply ships' now docked in the harbors. These men surged forward, joining with their new Irumian allies, and despite heavy losses drove the Shadow back. Despite the supposed loss, Howlfang was regarded as a hero when he returned to the main forces. So harsh was his attack that his very name was considered a profanity in the city, a blasphemy to the Swan herself. 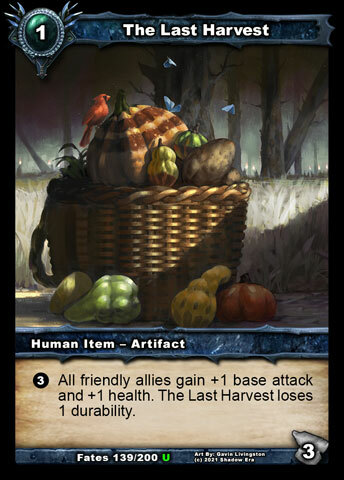 The destruction he'd brought down on the Vale had left its citizens terrified, and would drain the resources of the human forces in trying to rebuild it. Out of respect for his actions, the Man of Shadows even gave the Wulven a proper title, 'Terror of the Vale'. Really well written. As always. He is quite the Badass.